The bus drivers union contract with the Boston school system’s transportation contractor, Transdev, is set to expire Friday, and no agreement has been reached for a successor contract. The Boston school system was scrambling Tuesday to fill an unspecified number of bus routes for a dozen schools that started the year early, after an unusual number of bus drivers were absent, leaving schools, families, and students in the lurch. Problems with drivers not reporting to work began in the morning and grew worse in the afternoon as temperatures soared into the high 90s. The school system did not say how many drivers were absent. Some students were stranded at bus stops in the morning. In several cases, schools made a flurry of calls to parents, notifying them that buses might be late in the afternoon or not arrive at all. The fiasco dampened the first day of school for many students at Boston Collegiate Charter School in Dorchester. Boston Collegiate had two uncovered bus routes in the morning and four in the afternoon. After dismissal, Varon walked a group of students as young as 10 to the JFK T stop, about 10 minutes away, while families and other adults dropped everything to get to school. It’s not clear what prompted the absences. 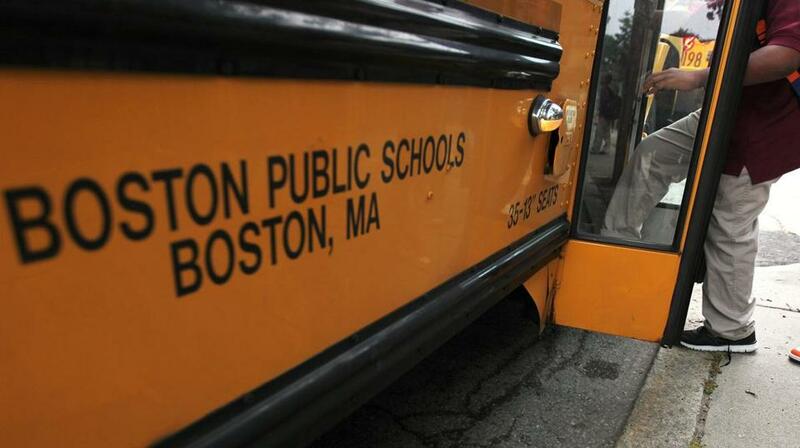 The Boston school system sidestepped questions regarding potential labor unrest. The bus drivers union contract with the school system’s transportation contractor, Transdev, is set to expire Friday, and no agreement has been reached yet for a successor contract. That contract is negotiated between the company and the union, while the Boston School Committee’s only official role is to approve funding. Nine of the schools are independent charters, for which the school system must provide transportation under state law, while the three other schools are within the school system. At least one more charter school is set to begin classes this week. Three of the affected schools had three or more routes with coverage problems. The union and Transdev ended up agreeing to a two-month extension, and buses ran for summer school. The school system expressed optimism as recently as last Friday that a new contract would be settled by the start of the school year. The school bus drivers union could not be reached for comment late Tuesday afternoon. But on Friday, Andre Francois, the union president, expressed concern about the bus routes for the coming year that were developed by the school system. “Things are not looking good for getting children to school on time with how the city made the routes,” he said. The school system, which has been trying to curb transportation spending for many years, expects to have 616 bus routes this year, up from 608 last year. Transportation accounts for more than 10 percent of the school system’s $1.1 billion annual budget. The bus drivers union contract is one of two BPS labor agreements set to expire at the end this month. The other is the Boston Teachers Union contract. Both sides on Friday characterized the talks as productive.